DEP South District Director Jon Iglehart presents the 2017 Plant Operations Excellence Award to representatives from the Peace River Manasota Regional Water Treatment Plant. 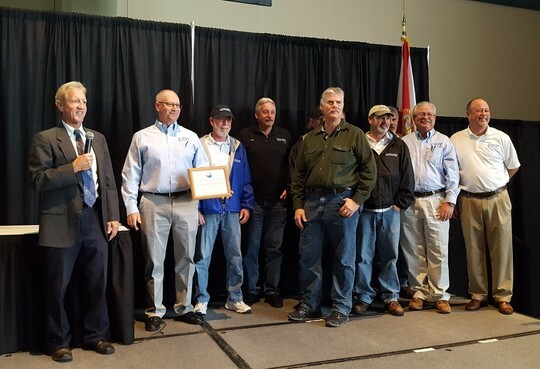 Other recipients of the 2017 Plant Operations Excellence Award include the Island Water Association and the Collier County South County Water Reclamation Facility. PUNTA GORDA, Fla. – The Florida Department of Environmental Protection presented the 2017 Plant Operations Excellence Awards to two South Florida drinking water facilities and one domestic wastewater facility at the annual Focus on Change Seminar. Drinking water facility award recipients were the Island Water Association and the Peace River Manasota Regional Water Treatment Plant. The wastewater facility recipient was the Collier County South County Water Reclamation Facility. The department is awarding a total of 14 facilities, including six domestic wastewater facilities and eight drinking water facilities statewide. The other awards will be presented at district ceremonies during the Focus on Change Seminars in Pompano Beach, Ocala, Haines City, Lake City and Panama City.